To many residents in Miami, climate change is personal. To Zelalem Adefris, climate change is her life’s work. Building on her passion for public health and environmental activism, Zelalem moved to Miami a few years ago to become the Climate Resilience Program Manager at Catalyst Miami. Zelalem works to educate residents on the local impacts of climate change, connecting climate change to social justice initiatives and implementing programs that strengthen the resilience of communities. It’s no secret that South Florida is ‘ground zero’ for rising sea levels and that many scientists predict major flooding and inhabitable communities within this century if drastic measures aren’t taken. Catalyst Miami has created CLEAR Miami (Community Leadership on the Environment, Advocacy, and Resilience) to provide the groundwork to bring about change by recruiting educators, leaders and innovators in their own communities and beyond. 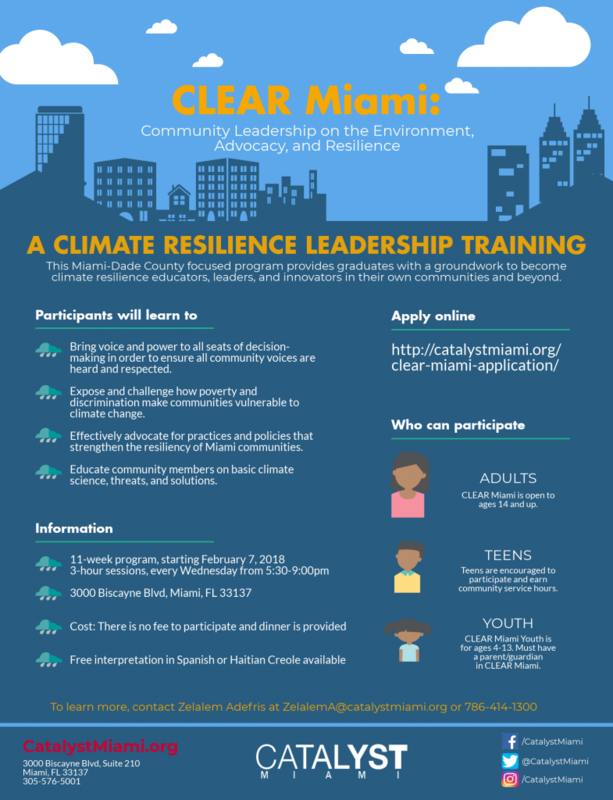 Participants will learn how to advocate for policies and practices that strengthen the resiliency of Miami communities, educate residents on basic climate science, threats and solutions as well as expose and challenge how poverty and discrimination make communities vulnerable to climate change. This free leadership training starts on Wednesday, Feb. 7 and runs 11 weeks. We’re excited to be participating in the training and hope you will join us. This article was originally posted on Planted in Miami.